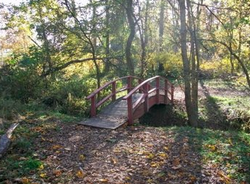 A part of Sprigg's Playland and Petting Zoo, the Nature Trail provides guests an atmosphere that is reminiscent of a simpler time. Following the path of the old Railroad Tracks that ran between Hodgenville and Elizabethtown, take a scenic stroll under the plush wooded canopy of trees with vast abundance of undergrowth border. Enjoy learning about nature by reading the informational postings along the way. 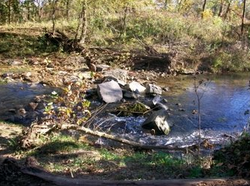 Midway through, take a few relaxing minutes and enjoy the tranquil sound of the flowing waters along the banks of Middle Creek. From there, trek over a recently added arched bridge that spans a spring fed brook to emerge on the edge of the T.Wister corn maze. All new for 2015, enjoy the hiking trail portion that winds through the woods, crosses two additional bridges, overlooks a spring that feeds Middle Creek and is accented with an abundance of goldenrod, Kentucky’s state flower. Experience another ecological marvel as you travel near two natural wetlands laced with cat-tails and other marsh loving plants. Conveniently, the end of the Nature Trail returns you to the other attractions in Sprigg's Playland. Note that parts of the expanded Nature Trail may be inaccessible for guests with limited mobility or endurance.